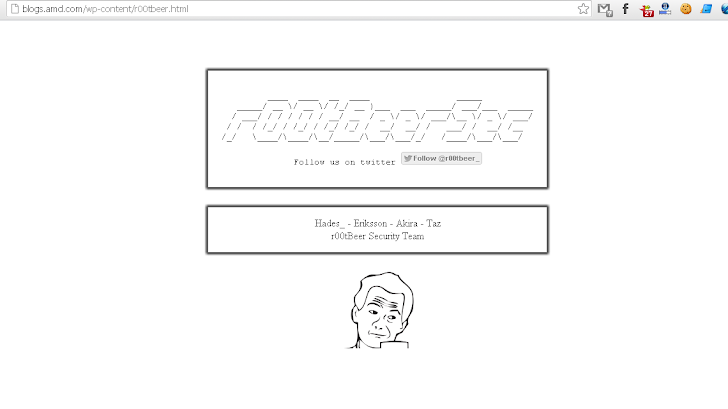 A team of Hackers called, "r00tBeer Security Team" today hack into official blog of Advanced Micro Devices (AMD) which is a American multinational semiconductor company. AMD is the second-largest global supplier of microprocessors based on the x86 architecture and also one of the largest suppliers of graphics processing units. 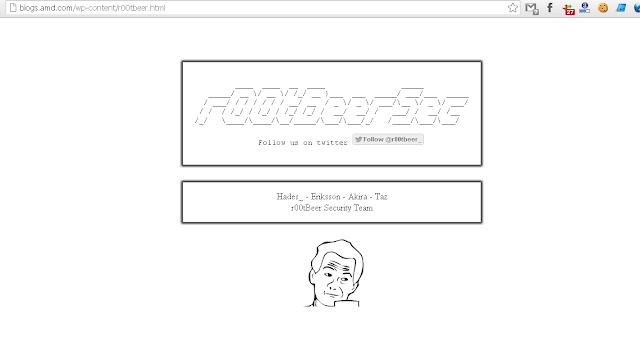 Hacker deface the blog page (http://blogs.amd.com/wp-content/r00tbeer.html) and also leak the complete user database of blog on his twitter account. Leaked database SQL file uploaded on Mediafire by Hackers which include 200 AMD user's Emails, Wordpress Blog Usernames and Passwords. Now only AMD, these hackers also hack another High Profile website called "TBN - The Botting Network", A Popular forum to learn How to make Money with 96000 members was got hacked and Complete database was also leaked via Hackers Twitter Account. Update : John - Edelman, on behalf of AMD replied that "AMD's blog site was the target of an attack on August 19th. We believe that the attackers posted less than 200 registered usernames and salted password hashes to a hacker web site. AMD uses salted password hashes, which is an industry best practice for encryption and extremely difficult to crack. We immediately took the blog site offline and changed all passwords. AMD remains committed to data security and user privacy and has launched an investigation into this matter. We expect to bring our blog site back online within the next 24 hours."